This event will address the global crackdown on civil society space and the resulting challenges in protecting fundamental rights and freedoms. 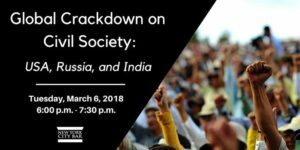 While threats are global, documented in over 100 countries, this event will focus on those experienced specifically in India, Russia/Eastern Europe and the United States. The worldwide trend, which extends beyond authoritarian regimes to democracies in many regions, includes new laws restricting or prohibiting protest and other forms of political activism; direct targeting of activists, journalists, and human rights defenders; and regulatory and funding obstacles aimed at non-profit organizations. Discussion will address restrictions on the freedoms of assembly and expression in the United States in the context of a worldwide pattern of shrinking space for civic engagement and dissent. The speakers will also share resistance strategies activists and human rights defenders are using to counter this crackdown.